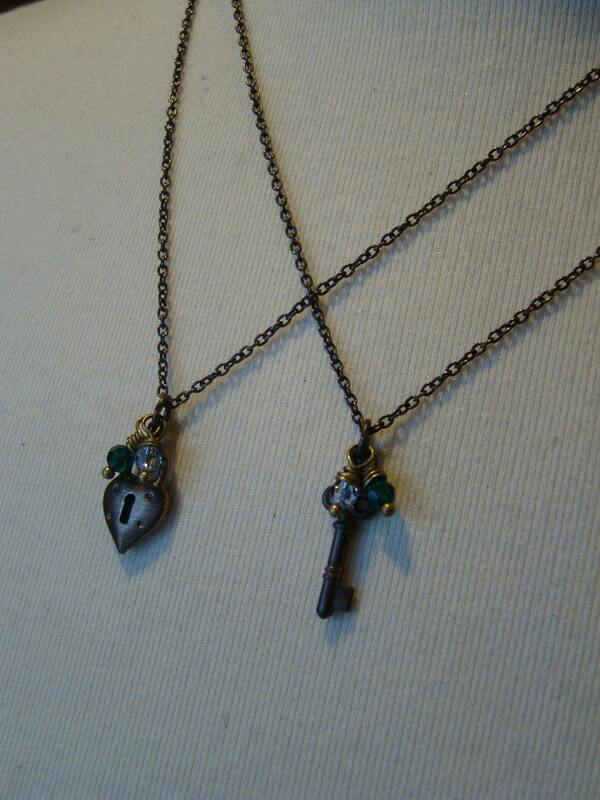 Set of heart lock and key necklaces. Great Vintage look brass puffed heart and lock charms hang from a delicate brass chain measuring aprox. 17 inches in length. Charms measure aprox. 1/2 an inch. Birthstone crystals of each person wearing the necklaces hang with the charms. Lobster claw clasp. Beautiful necklaces! I purchased these for my mom and I. She loves it! Beautifully done! Thank you! The Two Peas and a Pod necklaces are a great Best friend gift. The personalizing with birthstones make it even more special. 49 years is a long time to have a great friend! We're Two Peas in a Pod. Just got home and opened my mail! My Dragon fly bracelet came in! Dragon flies are my favorite and this bracelet is so unique! It's well made and just beautiful! Great communication and fast shipping!!! Will be doing some early Christmas shopping for 2015 with DRAGONFLYTEARS! Payment is expected at time of purchase unless other arrangements are made. Just convo me if you are unhappy with your purchase and I will be happy to resolve the issue. While my custom items are not refundable I will be happy to work with you to make everyone involved happy. I can not be responsible for lost items, but insurance is available if interested, just convo me. Please note that my items, while many are mother daughter necklace sets are meant for older children who pose NO risk of putting items in their mouth. While my items are strong and durable...little teeth chewing on any of these necklaces can pose a choking hazzard. Please do not purchase my necklaces for little children.